So, I’ve had a couple of days with my Oculus Rift DK 2, and it’s been a whirlwind of screen time since Thursday, when it arrived! It’s time to jump deep into the world of virtual reality – hands on! First things first: the headset! For those of you who haven’t had a chance to try it out, the Oculus Rift is a solid device, though heavier than the Gear VR (the Oculus clocks in at just under 1 pound) with an over-the-head strap that guide the cables back over the wearer. The device is cushioned with roughly a half inch of foam, which makes it pretty comfortable against the eyes, but I had a ridiculously difficult time trying to get it on myself the first few times. The lenses were quickly smudged, but after a few tries I got accustomed to maneuvering the headset on without sliding the lens down my forehead and it was go time! It took a few tries to get the displays set up on my MBP, but what I finally found that worked was using the HDMI port for the Rift and the lightning port for an external display, and setting up the built in display to mirror the Rift display (the external display was for everything non-VR). After some trial and error, I was able to load up my first experience on my own Rift! 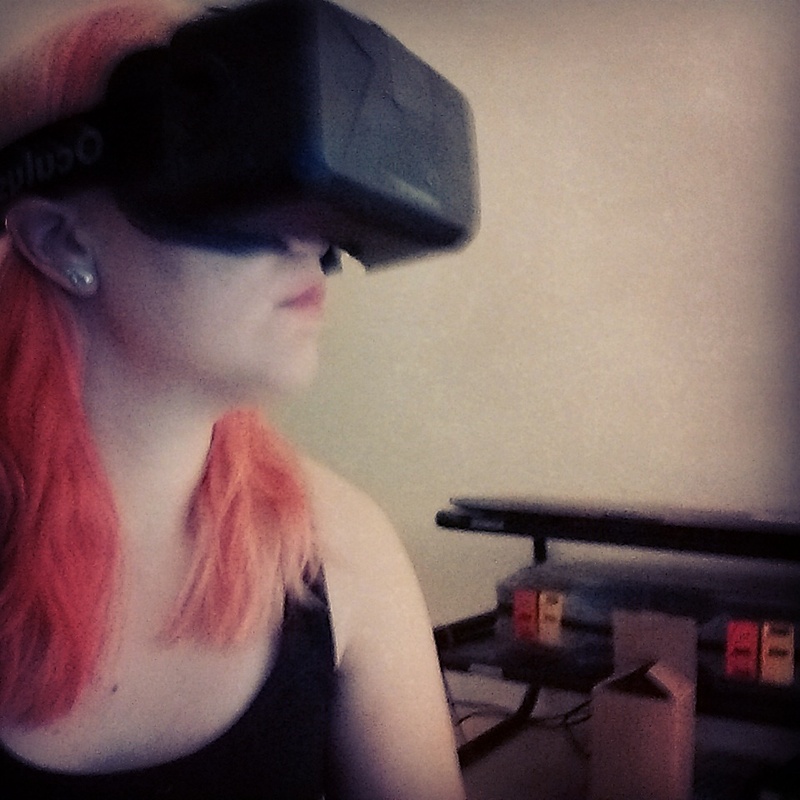 The first thing I tried out was the Tuscany Demo from Oculus to get a feel for getting the window aligned properly in the Rift display, and my sister laughed hysterically as I spun around my living room with the headset on proclaiming “I’m in Italy!” I also learned quickly that Rift selfies are next to impossible, but that didn’t stop me from trying! But the real reason that I was distracted from fully getting immersed this weekend was that I got sucked back into Unity and was sidetracked trying to see if I could get the Oculus Mobile SDK working on my Nexus (spoiler alert: not yet) and starting on a simple scene for Christmas to show my family when I’m back for the holidays. Trees! 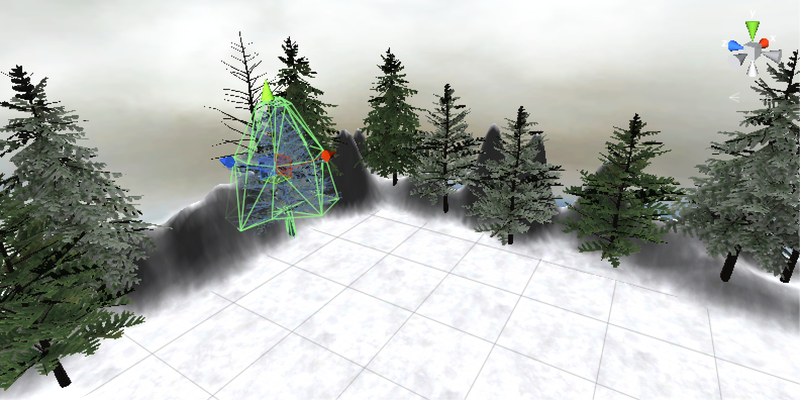 Mesh colliders, even snow! It’s Christmas in my Macbook Pro! Unity tip of the day: To change the size of a terrain object, on the properties panel for the GameObject, change the resolution from the default (2000) to your desired dimensions. On the VR side of things, I did get a chance to try out the first recommendation – Radial G (http://radial-g.com/) – and it was an incredibly unique experience. What stuck out to me was how natural being immersed in the game felt – even though it definitely made me a bit motion sick, which I blame on the fact that I still haven’t gotten my glasses to play nicely with the Rift. The pace of the game made me feel immediately engaged with the environment, a sci-fi futuristic cityscape, and my Wave Runner nostalgia kicked in to send me zooming off over the speed boosters. Tonight, I’m downloading Guided Meditation, because this week’s been stressful already and I need to get my zen on. Additionally, if you know of any really cool kid-friendly demos other than the ones I’m already taking a look at, let me know! I’ll be working at a hackathon in a couple of weeks with some middle school students and will get a chance to let them play around with the Rift, so suggestions are welcome and very much appreciated! Previous PostIT’S HERE, IT’S HERE! Your initial DK2 experience so far is very familiar. I had mine a few months ago. Welcome to the community. I highly recommend Vanguard V. It’s too bad they didn’t get fully kickstarted. Their team has amazing talent. Did you mean WaveRace 64? https://www.youtube.com/watch?v=qrmMKLTqFSo CLASSIC! Someone needs to bring the dolphin back in VR. Ah! Yes! I absolutely meant WaveRace 64! That music just totally kicked my nostalgia into full gear. I would love to see my favorite N64 games make it into VR, it looks like there is some work being done on emulator support which is awesome! I’ll definitely take a look at Vanguard V in the meantime.